The first copy of her first book has reached her home. 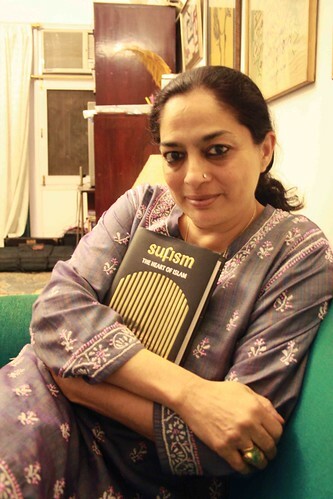 On the evening of April 23rd, 2009, author Sadia Dehlvi was beaming like a happy child in her Nizamuddin East drawing room. Finally, she had her first book, Sufism, The Heart of Islam, clasped tightly in her hands. Earlier in the day, Harper Collins India, Ms Dehlvi’s publisher, had sent her a copy of the book hot off the press. Notwithstanding her excitement, The Delhi Walla pestered her for an interview over a cup of green tea. Congrats Ms Dehlvi, how many years it took you to finish this book? Mayank, I can’t tell you how happy I am. Although I have contributed essays on Delhi’s cuisine, people, lifestyle etc. for a few anthologies, this is the first book I have authored. I wrote it all here – in my drawing room, on this sofa, on this Mac. I would write till late in the night. The book had become an obsession and I did nothing else during the course of writing it: no parties, no films, no lazy lunches, no other fun stuff. Who inspired you to write the book? My mom, who not only inspired me but helped me with the content. Ammi has been my guide on the Sufi path and for years I have heard her talk about what I finally wrote in the book. It’s when I did the research and poured over every little detail that all the terms, stories and Sufi teachings began to make sense. Ammi also helped me translate from Urdu manuscripts and literally checked every sentence in the book. Besides, she has been praying for me, and for the success of this book. However, she has told me not to expect anything worldly from it. She says that this book is my one good act in life which might just redeem me on qayamat (Judgement Day). Besides, I’ve been busy going with her to have the book blessed at the dargahs of Khwaja Qutub, Shah Farhad and Hazrat Nizamuddin Auliya. I would now like to go to Madinah with the book and offer it to my beloved Prophet. Does any Delhi sufi saints feature in the book? Of course. Many, many of them. Among the prominent Chishtis there is Khwaja Qutub Bakhtiar Kaki, Hazrat Nizamuddin Auliya, Amir Khushrau, Naseeruddin Chiragh Dilli, Shah Farhad, Bibi Fatiima Sam, Mai Sahiba and Shyakh Kaleemullah. From the Qadri, Naqshbandi and Suharwardi orders there are Shaykh Samiuddin Suharwardi, Jamali, Abdul Haq Mohaddith Dehlvi, Jehanara, Khwaja Baaqi Billa, Khwaja Mir Dard, Mirza Jaane Janan and some others. But Ms Dehlvi, have you ever wondered why women are not allowed inside the main shrine of Nizamuddin? This is a decision made by the caretakers of that particular dargah. In some dargahs they allow women while in others they aren’t allowed. There is nothing religious about the decision and is largely due to customs followed by the caretakers. In Ajmer Sharif, the most important dargah of the subcontinent, there is no restriction on women going inside the dargah of Khwaja Gharib Nawaz. Maybe that’s why Ajmer is so special. I go there a few times each year. You see, Ajmer wohi jaate hain jinhe Khwaja bulaate hain! Since you’re a fellow dargah-junky, let me ask you how many dargahs you visit each week? I never miss a Thursday haziri at Hazrat Nizamuddin Auliya, and usually go for the dua e roshni which is held daily before the sunset prayers. Then I stay on for the prayers and for the qawaali that follows. I go on other days as well. Luckily, I live in the neighborhood so it’s just a hop across. Usually on Sunday mornings, I visit the dargah of Shah Farhad near the Pratap Chowk metro station. That, too, is a very special dargah. My grandfather used to visit it regularly. He commissioned the roof that you see over it. Despite being next to the main road, it’s very peaceful there. With the Muslims getting bad press worldwide, how do you cope as a devout Muslim? Well, that’s what started the book. On one hand you have the radical Islamic voices and on the other hand you have the growing communal divide. I think the majority of us are moderates and we feel somewhat cornered. I myself experienced a crisis of faith that led me to explore the rightful traditions of Islam. But yes, Mayank, the growing extremist voices in Muslim communities are extremely disturbing and there is an urgent need to reflect within. My faith gives me a lot of strength and hope for Islam is not a religion of despair. Allah tells us to be patient in times of crisis. Have faith and the truth will prevail. On a lighter note, we often laugh away the stereotypes with our very own brand of Muslim humour. We tell friends we are not going to blow them up! According to your book’s title, sufism is the heart of Islam. What is the heart of Delhi? For me, it has to be the dargah of Hazrat Nizamuddin Auliya. It symbolizes the Indian traditions of love, tolerance, equality and brotherhood. People from different backgrounds and faiths all gather here to seek the Saint’s blessings, as they have been doing for the last seven hundred years. In this dargah, people are fed, clothed and are given a roof over their heads. This darbar is the soul of Delhi. I wish the civic authorities would work to clean up the area and that the dargah’s dome, at least, must be made visible from the main road. This shrine is not a monument but a living legacy that represents the essence of Hindustan. As a Delhiite, what do you like about the non-Muslim Delhi? I love everything about my city… its chaos, the trees, parks, the museums, people, everything. But I don’t respond well to the new high-rises, pollution and malls. I’m especially fond of Lutyens’ Delhi, Connaught Place, India Gate, Lodhi Garden, Sujan Singh Park, Khan Market, India International Centre, Chandni Chowk, and… Mayank, are you getting tired of jotting down these names on your notepad? You see my list will not stop. I can never leave Delhi for long. I love it too much and want to be here all the time. Come to think of it, I rarely move out of my house. I could stay in for days at a stretch… the only daily outing I would seek is an evening stroll in the park outside. er at your house. You are superb in Delhi’s Muslim cooking. … no really. In summer, however, one doesn’t eat much mutton. My son is a strict non-veg and so I have to cook keema for him all the time. Personally, I like cooking more than eating and am happiest cooking for friends. I’ve recently learned Italian. You must try my pasta one of these days. When you want some quiet, some introspection, where do you go in Delhi? In winter months, I love curling up with a book in my drawing-room sofa. Or I walk around at the garden in Humayun’s tomb. The dargah of Bibi Fatima Sam is also a nice place to sit quietly and meditate. But frankly, it has taken me four years to write this book and I had no time to do anything but write and re-write the manuscript. Now I’m looking forward to going up to the mountains for a few days, maybe to Kashmir where I can read, listen to music, introspect and chill. Wow… will it have the society gossip? Can’t reveal, Mayank. You’ll have to wait. congratulations to ms. sadia dehlvi for her published book. i have noticed that most writers use macs. whys that? makes writing easier i suppose? Sadia is a Pride of Delhi and is known the world over. Thanks for posting her interview. All the best for the book. Now I know why she was not writing for HT anymore. BTW, why has Rakshanda Jalil stopped writing on Delhi? Does she write a blog too? Sadia ji is looking very beautiful. Specially her large eyes are beautiful and full of life. i wish i could meet her. Congratulations to her for her book. I know (from this blog) that she belongs to the family of famous urdu publishers. One of their popular magazines was ‘Shama’ risala , a film oriented magazine in urdu and it had been read in our home. It also had the famous crossword quiz behind it. I was a child then and first i got attracted to the photos of famous filmi personalities printed in it and as i learnt to read urdu i enjoyed reading bollywood material in ‘Shama’. I am complete movie buff since then. I remember meeting Sadia, alongwith her father Shahid A. Dehlvi, at the Karachi Press Club; more than two decades back! She was always considered to be a really brilliant person. She and her mother also used to help her father in the publication of their SHAMA; which was tremendously and equally popular in Pakistan, as well. I wish her all the best in her future endeavours, too. Women have really “come of age”, Kudos! This lady always talks in ‘we’ (Muslim) and ‘they’ (Hindu). Wonder why she didn’t like her husband’s country (Pakistan) when in India, she only loves Muslims and Muslim areas in Delhi. This is Rehana Ali Ghumro from Pakistan, Sindh.. I have read your book SUFISM and found it amazing, seriously the way you explian the tryst with sufi, is realy very touchable. I know you had a good knowledge about all sufi no doubt you had studied alot, But here i want to mention onething that you havnt mention Sindhi Sufi like Shah Abdul Bhittai and Sachal Sarmast, who played very important role in sufism. Hope you got my point of view. Annoxialy waiting for reply on my email.